Suppose you want to make a list of members with names and unique id numbers for your newly born 'Samba' club. 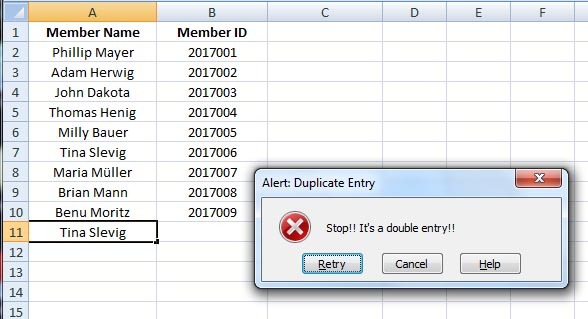 So you would like to prevent double entries for member names. 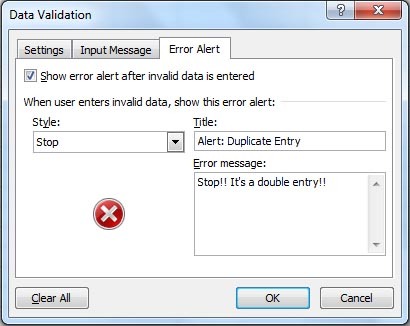 Under Error Alert type Alert: Duplicate Entry. In the Error message box type: Stop!! It's a double entry!! So when I enter =COUNTIF($A$2:$A$15;A2)=1, the COUNTIF function returns a TRUE if it finds the criteria A2 (or Phillip Mayer) within the given range ($A$2:$A$15) and allows the criteria (Phillip Mayer) to occur only once (=1) within the range. So, if you try to enter Phillip Mayer second time, it gives you an error message. What about Milly Bauer in cell A6? How it works in this case as in the formula only cell A2 is given as criteria. Well you have selected the whole range before you went to data validation, so the formula is copied automatically to other cells. 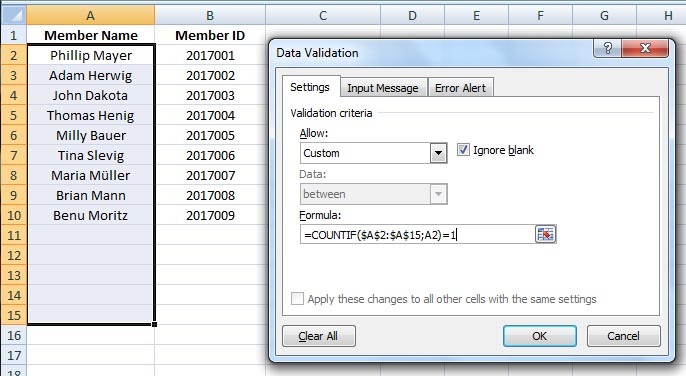 Just select the cell A6 or Milly Bauer > now go to Data > Data Validation. In the window you will see the formula takes cell A6 as its criteria =COUNTIF($A$2:$A$15;A6)=1. By the way, I am using Excel 2007.